At the start of the game, use those 5-block pieces that become difficult to play later on and build towards the centre of the board. This maximizes the possible directions that you can take when the other players start crowding the board. Sneaking into new territories is the key to a successful game. The common Blokus strategy is to use the big pieces first, block out some space, and try to keep people out. What you want to do is stay close to the other players by moving into their line and getting into their crevices as much as possible. That way you have plenty of points to move across the line later in the game. Try it! While the name of the game implies that blocking is the main strategy of the game, often placing pieces in such a way that both players can cross each other is actually the best move. When you block, opponents can block you. When yo cooperate, the rule specifying that they cannot place a piece adjacent to their own makes it very difficult for them to block you. Try it next time. Here’s the ordeal – when you block another player early on you immediately enter the table’s hostility radar. And blocking moves tend to leave your piece as the blocker with little options to encrouch their territory. This can very quickly escalate into other players boxing you in as a defensive reaction and you having limited territory late game. Instead, in the early dawns of conflict (usually as players reach the middle), use your pieces to touch other player’s pieces in such ways that both pieces are not blocked, but instead have room to go where the other came from. The less intrusive you feel to them, the more the other player will find target points other than you to focus on. You’re esentially slipping under their radar, gently nudging them to go the other way while granting you access. Even better if they then proceed to engage in blocking wars with another player. For this reason, sometimes the best way to handle the early middle conflict is to take the long route around another player’s pieces as you try to gain access to all sections of the board, instead of trying to be King of the Hill only to be boxed in from 3 directions the next round. Do this with everyone so that you have access into all 4 quadrants of the board late game, and it will increase your survival rate tremendously. This low-intrusion approach also means you need to allow it if other players wish to encroach your territory – let them. For one, your own territory is hard for you to use because it’s already flooded with your own pieces that you may not touch, so it is already of lower value to you than other territories on the board. Secondly, if by letting them in you get the chance to enter theirs and other players’ territories unprohibitedly, more power to you. That’s a worthy seemingly-sacrificial move. Even better, if you can prompt other players to duke it out on your start field while you quietly sneak into theirs, then by all means let your home be a battleground. 2 player under normal rules isn’t very fun. We often play with each player controlling 2 colors to take up more room on the board. Another variation is to add a 3rd “mystery” player, with each player taking turns playing the 3rd color. 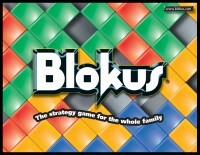 However, the best solution is to purchase the Blokus Travel edition, perfect for 2 players. 1. Since you are suppose to place the pieces connected by their tips, at the beginning of the game (while you are building towards the center) use the ones that give you more options. A 5 piece will give you more options than a straight or a square. 2. Use your small pieces to get through to your opponents territory. Not your typical tip: nothing to do with gameplay, everything to do with maintenance. The plastic pieces of Blokus are fantastically resilient and are ideal for games when messy fingers are inevitable — pizza and wings go well with this game. When the game is over, toss the tiles in a Salad Spinner or colander, then run them under hot water and dish soap. Not many games you can do that with.